Vada's Blog Stamp Inks and Paper : Coffee and Cream. I’m adding my card into two challenges. My stamp is from Art By Moonlight, she was stamped on Glossy that I stained with Antique Linen. I chalked her face and hat. I used a new Spellbinders Die called Anemone Flower to make the flower. witch I stain with Gathered Twigs distress ink. I hope you will stop into Fashionable Stamping Challenges and Our Creative Corner and join us in these Challenges. So elegant and beautiful! Love this Vada. Totally stunning! Love the lacey look! Vada...your work always takes my breath away! Elegant! What everyone above me said! Vada, I always enjoy stopping by for a visit! This card is so elegant! Love the image and the border punching is all so perfect! So excited that you joined FSC! Have a lovely evening! Oh wow ... this is just beautiful ... love that layered flower and the gorgeous vintage image! Oh this is super stylish and I just love your stamp!! Thanks for joining us at Fashionable Stamping with your very chic card. That's a wonderful card. Thanks for joining the Fashionable Stamping Challenges. A beautiful, stylish card. Thankyou for joining us at FSC this time. 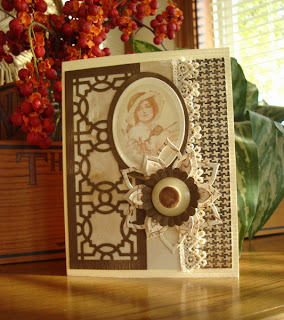 The lattice behind the image is stunning and adds a lot to this card. 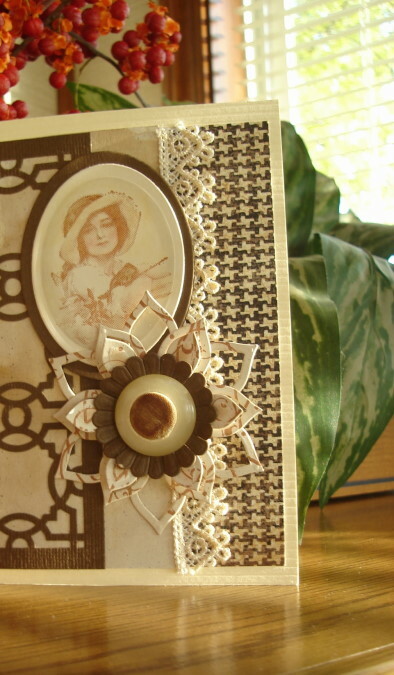 The nostalgic image is amazing and the Spellbinders flower is a beautiful finishing touch. Thanks for sharing your talent with us this week on Our Creative Corner! This is just stunning! 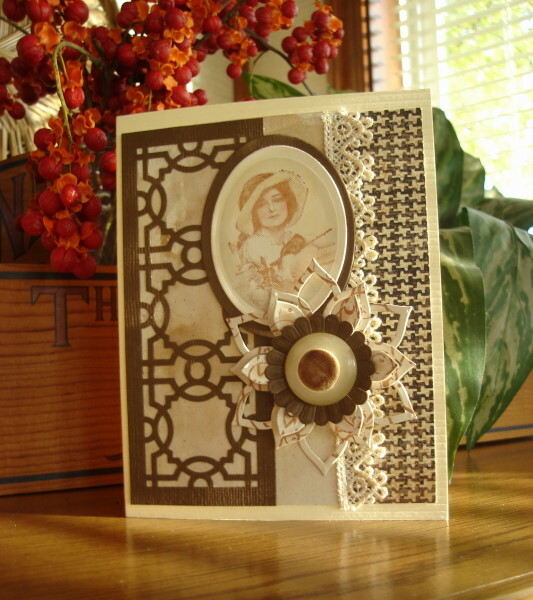 I love how the neutrals on your card all work together! Oops..forgot to add "thanks for playing along with us at OCC!" Beautiful card and lovely embellishing Vada.